The Fraser River was recently named as the third most endangered river in the US. Since then, the Fraser has come under increasing pressure. To find out why, and what you can do about it, keep reading. 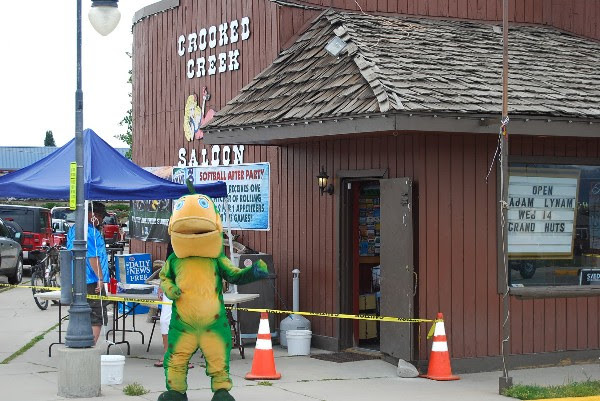 The local town of Fraser was known as the Western Whitehouse during the Eisenhower administration because Ike spent so much of his free time here fishing the Fraser and other local rivers. Today, the Fraser River still offers excellent fishing despite the diversion of the majority of its water. 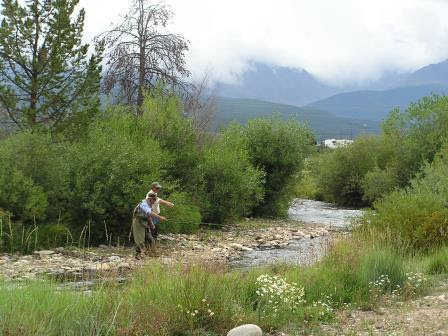 The Colorado River Headwaters Chapter of Trout Unlimited is one of the leaders in the effort to protect the Fraser, the headwaters of the Colorado and the associated cold-water fisheries in a difficult situation. Our members are dedicated to protecting this amazing fishery and environment to the best of our ability. We understand that previous generations of western Colorado residents sold the rights to a substantial portion of the water that originates here to communities on the Front Range of Colorado, and that has consequences for our rivers today. We realize that much of the water which historically flowed through the Colorado to the Gulf of California and the Pacific will continue to be diverted across the Continental Divide to Front Range cities and will ultimately find its way to the Gulf of Mexico and the Atlantic Ocean. While we would like to see as little water diversion as possible, our efforts are focused on minimizing the effects of that inevitable water diversion on the natural environment. It's the message on those blue oval stickers that adorn so many car bumpers and tailgates. By now, hopefully just about everyone in Grand County is familiar with the phrase. So what is this all about, anyway? What's up with the Fraser River, and why do we need to save it? The Fraser River begins as a tiny headwaters stream near Berthoud Pass, flows through the towns of Winter Park and Fraser, and finally reaches its confluence with the Colorado River near Granby. It provides prime fishing and other recreational opportunities, not to mention it is the critical artery of the entire valley's ecosystem. This river also happens to be one of the primary sources of municipal water for Denver and other Front Range communities. Some 60 percent of the Fraser's flows are diverted under the Continental Divide to the Front Range through the Moffat Tunnel system. This diversion system is what prompted the Save the Fraser River campaign. Obviously the Front Range needs water, but according to current water laws, Denver Water could legally drain the river dry. As the amount of diverted water has increased, so has the need to monitor the health of the river. This is where the campaign comes into play. This campaign, championed by the local Colorado River Headwaters chapter of Trout Unlimited (TU), is intended to raise awareness about Denver Water's diversion project. The campaign also aims to protect and preserve the Fraser from the effects of the diversions. I had the opportunity to become active with our local chapter of TU. I continue to be impressed with the organization's efforts in conservation and education, and I am grateful to be a part of the efforts. We were successful recently in finally establishing an agreement with Denver Water to incorporate a balance between water diversion and river health, which took years of negotiations to accomplish. This agreement is known as a "Mitigation and Enhancement Plan," which includes measures to reduce the impacts of the water diversion project and to improve existing stream conditions. Much of this Mitigation and Enhancement agreement incorporates a "Learning by Doing" management approach that closely evaluates the health of the river. Water temperatures, aquatic life, riparian vegetation, and other vital signs are monitored to ensure the river and its ecosystem is preserved. This agreement was accomplished in large part through public support, so again, thank you to everyone who has supported the Save the Fraser River campaign! This campaign and its initiatives are an ongoing effort. We still need more resources: to continue stream monitoring and improve river habitat; to continue offering chapter events and educational outreach; to ensure that TU attorney Mely Whiting can continue to represent the Fraser River on behalf of our campaign. That's why we at TU would like to encourage the community to continue the campaign with us. We have several events and activities planned throughout the season. Our chapter's annual banquet is held each year during July at the Devil's Thumb Ranch. With dinner, drinks, door prizes, and both live and silent auctions, the banquet is a really fun way to support the Fraser River. Other events, including the Riverstock concert and National Public Lands Day, are scheduled for later this summer – stay tuned for details! Both corporate and individual sponsorships are available. Corporate sponsorships include complimentary tickets to the banquet, as well as special recognition at the banquet and in TU media. Several individual sponsorship opportunities are also available, including Silver, Gold, and Diamond sponsor levels. These sponsorships are a great way to show your support and provide critical resources for the Fraser River. Whether it’s a sponsorship, a donation, or just rolling up your sleeves to help, there are plenty of ways to support the ongoing campaign to Save the Fraser River. To stay updated on the campaign or to contact us about sponsorship opportunities, we encourage you to visit our website at www.coheadwaters.org and to check us out on Facebook at facebook.com/SaveTheFraserRiver. You can also sponsor the Fraser River at Winter Park Optical near Safeway in Fraser. Together we can protect and preserve the Fraser River for generations to come. Thank you again for your support! The document available by clicking here is a summary of the proposed agreement. Please note the marked segments in particular. This summary is about the proposed agreement, rather than the entire project summarized below. Confused about the Moffat Diversion Project? This Executive Summary is about the Moffat Firming Project itself and it's likely impacts, rather than about the proposed agreement you can access above. A study completed by Colorado State University in the fall of 2013 brought up serious concerns about the impact of reduced flows resulting from the Moffat Project. This is the sort of science based analysis that helped lead to the favorable agreement proposed in March, 2014. Supporting TU helps us to develop and use this sort of information in our efforts to protect our rivers and the environment. We believe the important decisions about our rivers and the environment should be influenced by science not money or politics. For an excellent, readable summary of the study's results, click here. And we thank you – our members and supporters – for all that you have done throughout this effort to make this achievement possible. You’ve turned up at public meetings, submitted letters and comments to regulatory agencies, taken part in rallies to support the river, shared theFraser the Trout video with friends and signed the petition of support for the river – all of these individual efforts and actions have added up to a powerful force for change and truly made a difference for the Fraser River. I’m very proud of what “Team TU” has accomplished together —national staff, state council and grassroots all working together. Mely Whiting of TU’s Colorado Water Project has put blood, sweat and tears into this campaign for years, attending countless meetings, crunching mind-numbing technical data, and negotiating the shoals of the federal permitting process. Our Council staff and volunteer leaders like Sinjin Eberle have helped at every step with negotiations and public education. TU’s Colorado River Headwaters Chapter and its president, Kirk Klancke, spoke eloquently about the Fraser at every opportunity and spearheaded chapter-led restoration projects. (Kirk’s passionate advocacy was the subject of a recentNational Geographic profile online.) At all levels, TU has been working together to protect the Fraser and Upper Colorado. Grand County TV18 is currently airing the documentary series and is adding more episodes as funding permits. You can watch the series on Comcast channel 18 in Grand County and streaming live on the internet at http://grandcountytelevision.com/ There is already lots of good information included with more on the way! We hope to create moree content for the show as funding and sponsorship becomes available. At TU, we believe litigation is too expensive, legislation is too slow and education is the key. We know we don’t have the same resources, political clout or funding that are available to the Front Range water users, but we want to do all we can to save the Fraser, the Colorado and our broader environment.